Audrey the turtle's shell will never form correctly. Audrey the turtle spent the first 20 years of her life living in a bucket, surviving on a nutrient-deficient diet of egg whites. 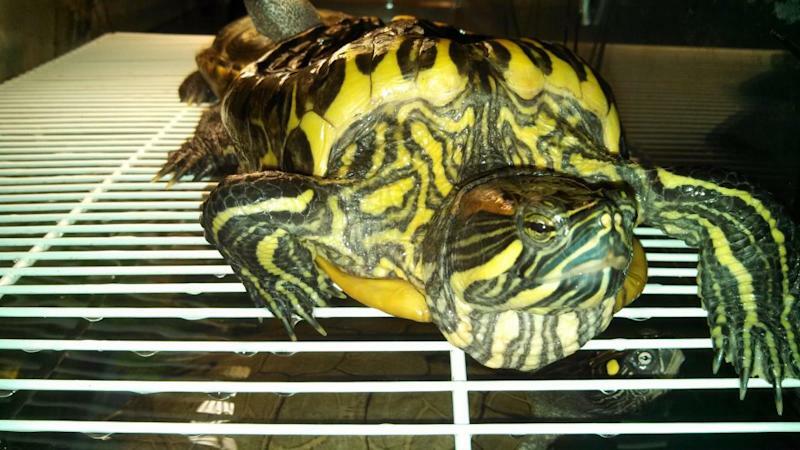 As she grew, the red-eared slider survived by deforming to fit her cramped home. "Over time, her shell started to look strange: individual scutes warped in lumpy, asymmetrical ways and her carapace twisted upwards like an umbrella caught in a storm. Audrey needed help, but didn't get it for twenty years," a Buzzfeed contributer wrote. When Audrey's owner died, she was brought to a shelter to be put down. Fortunately for the reptile, a vet intervened and gave her a second chance at life. "Audrey had a blood test, her shell was cleaned, and she was treated with fluids, vitamins and calcium. She started eating a balanced diet that strengthened her shell (although it would never grow back to a normal shape)," Toronto.ca said of the rescued turtle. "I was transferred between specialists before ending up at the Little RES Q turtle rescue in Toronto Ontario Canada. Now I'm part of their team as a spokes-turtle for animal cruelty against reptiles." Audrey is now Little RES Q's spokes-turtle, teaching the public about how to properly care for turtles. Audrey even joined Twitter, which quickly made her an online sensation. "I'm an animal cruelty case with a happy ending. I now speak for turtles everywhere," her Twitter bio states. Audrey's "happy ending" includes living in a large tank at Little RES Q with a soft platform that protects her soft shell from any further damage. Follow her story on Facebook here.